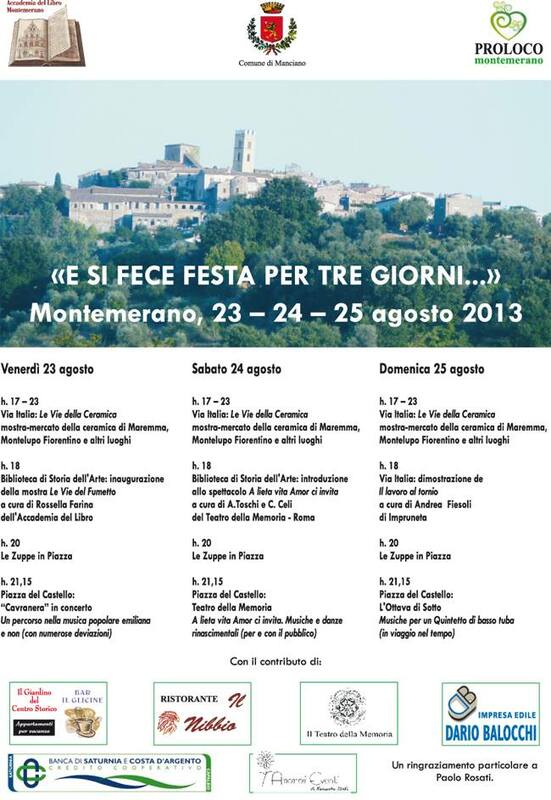 From 23 to 25 August the ancient hamlet of Montemerano will be the backdrop to the festival E si fece festa per Tre giorni produced by the Accademia del Libro di Montemerano, the Municipality of Manciano and Pro Loco Montemerano. Main features will be a ceramic art fair, an exhibition of art comics and three evenings of entertainment with – respectively – the Cavranera traditional Emilian music ensemble, the Il Teatro della Memoria early music and dance company and the L’Ottava di sotto bass tuba quintet. Also featured – every evening from 8 to 9 PM – will be the traditional cuisine of Maremma with Le Zuppe in Piazza. For the complete program of the festival: click on the right-side poster or check the Facebook event page. 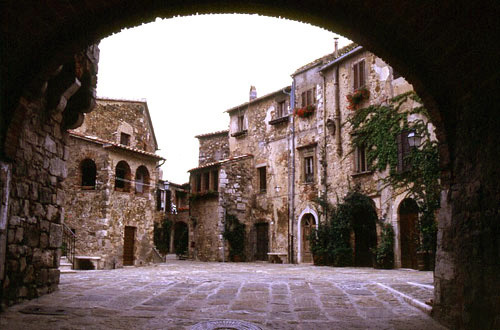 To reach the location: if you’re on the Thyrrhenian coast you can reach Montemerano through Manciano (from Albinia take the SS74, from Montalto di Castro the SP105); from the Viterbo area follow the signs to Pitigliano or to Valentano-Ischia di Castro-Farnese. From Grosseto take the SS322 and pass through Scansano. From Mount Amiata it’s possible to reach Montemerano through Saturnia (check the routes on Google Maps). If you come to Montemerano don’t forget to visit the Chiesa di San Giorgio with its beautiful 15th century frescoes and with the unique Madonna della Gattaiola.